» 7 Best Standing Desks in 2018 | Improve Your Posture and Increase Your Health! 7 Best Standing Desks in 2018 | Improve Your Posture and Increase Your Health! When scientists discovered that prolonged sitting can increase mortality risks, most office workers got alarmed. With a large number of adults employed in offices that require them to sit for hours on end, this can easily mean that they’ll experience the consequences of sitting. As a result, the best standing desks were introduced to the market. These standing desks are all the rage in office furniture for a couple of years now, thanks to their many benefits. They don’t just counter the bad​ effects of sitting but they also promise to help you burn some calories. Some experts say, however, that standing per se won’t make too large of a difference in the number of calories you burn versus sitting down. It will still have benefits but if you really want to burn more calories, moving around will be more beneficial. In any case, standing desks can still be good replacements to regular desks as standing can easily transition to other movements. If you’re interested in getting one of the best standing desks in the market today, this guide can help you choose your perfect match. Before you start looking for a nice standing desk that will compliment your office space, you might want to pause and learn a bit more about these products. As these products cost a decent amount of money, you should ensure that you won’t experience buyer’s remorse after. With these points, though, you might just be able to skip that kind of hassle. The very first thing that you need to know is whether a standing desk is suitable to the tasks you do on a daily basis and your physical capabilities. Having a bad posture may not really let you enjoy the benefits of this furniture. Leg fatigue is also something noteworthy as it can affect your performance. Experts also say that some tasks are better done sitting down than standing up. So, if what you do tends to fall into this category you should definitely consider various options. Your productivity should be prioritized, too. Lastly, it’s important to consider whether it will fit your space. Some folks might not really have room for a standing desk, especially if they’re not really planning to replace their old desk with this new one. In such cases, you might want to reconsider again. Should You Buy an Actual Furniture or Attachment? Traditional standing desks are the desks with additional height so you have to stand when using them. Sit-stand desks are more versatile standing desks as you can easily lower them into sitting height. Desktop risers are additional attachments that you can place on top of a regular desk to transform it into a standing desk. They’re portable and requires the least commitment as you can always just opt to not use them if you don’t feel like standing. Each one has its own pros and cons, so make sure to weigh your options first. The best standup desk should also have the right measurements for your needs. It should have adjustable height and a good height range for starters. Because people have varying heights, it’s very important that a standing desk is adjustable. It should also have a height range that will suit you so you can be sure that you’ll be able to use it. It should also be wide and deep enough to accommodate your equipment. Desktop risers tend to have limited spaces, but they tend to compensate with their structural design. Traditional and sit-stand desks, on the other hand, come in different measurements, so you have to take note of those as well. Desks are the last thing you’d expect to be electric-powered so the ApexDesk Elite Series 71" W Electric Height Adjustable Standing Desk might initially surprise you. However, after learning how functional it is, what might surprise you is why it took this long for this innovation to come around. Being a sit-stand desk, the electric component is actually to make height adjustments a breeze. One of the most popular reasons why a lot of people shy away from sit-stand desks is the fact that they can be hard to adjust. With the actual desk needing to be sturdy and capable of holding a lot of weight, it can be a struggle to adjust the height because of its heft. This can even be a bigger challenge if you have a few things on top. With an electric switch, you won’t have to struggle with the adjusting mechanism. This alone makes it highly qualified for this best adjustable standing desk list, but it actually has more features that you might find very handy. Another feature that can make this the best sit stand desk for many is its design. It doesn’t have a crossbar so you can use it to rig a custom setup in your office. It can be more easily used with a treadmill or stationary bike, giving it even more functionality. It should also be noted that this is a large standing desk. Measuring 71”, it will take up space. So if you might want to make sure that you have ample room for this piece in your office. 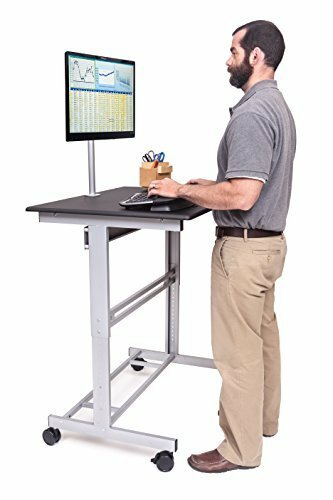 The Stand Up Desk Store 40” Mobile Adjustable Height Stand Up Desk with Monitor Mount may not be the best sit to stand desk in this list, but it has so many other things to offer. While it doesn’t have an easily adjustable height to make it the best sit stand workstation, it can be one of the most portable standing desks in the market today. Thanks to its wheels, you can easily move around with this table, giving you more versatility when you need it. Aside from its wheels, this product is also equipped with a height-adjustable monitor mount that swivels. This makes it even more suitable for those who want to ensure their proper posture by having their monitors at eye level. Set up an extra monitor for your laptop and you’ll be good to go. If you’re worried about your stuff falling off because of its light weight, fret not. This product is quite sturdy, so you don’t have to think twice about carting it around. Proper installation of the mount will also ensure that it’s securely attached to the desk. If you intend to use it with a desktop computer, however, maybe it’s better to keep it stationary as large CPUs can be tricky to move around. This product also received some of the best standing desk reviews because of its height range. A lot of users attest that it can be lowered enough to suit shorter users, so that’s a great plus. The Southern Enterprises Langston Desk isn’t exactly a standing desk on its own, but it can still make a good case for the best stand up desk with a nice riser. On its own, it’s a perfectly beautiful desk with its modern farmhouse style and rich espresso stain. While its height only measures 29”, it’s wide and deep enough to accommodate a good riser that will help transform it to a sit-stand desk. What a lot of people like about this product is contemporary appearance. It won’t look too bulky or utilitarian and it can easily blend into most homes’ interiors. This makes it an excellent choice for home offices and study areas. Due to its simple but elegant design, you can also easily find a riser that can look good and function well with it. It’s dark coloring will match lots of the available standing desk attachments in the market today, so you don’t have to worry about creating a cohesive design for your workspace. Its price is also very noteworthy. This product is very affordable. Some risers might even cost more than this desk, so it’s certainly a solid choice if you’re on a tight budget. Another product that has received great sit and stand desk reviews is the Stand Up Desk Store 48" Crank Adjustable Height Standing Desk. This medium sized piece is a manually adjustable sit-stand desk. It comes with a hand crank that will easily adjust its height from a nice sitting position to a standing level. Designed to be one of the most functional standing desks in the market today, this product offers enough counter space for your stuff. It’s also nicely sized to fit small offices, so you won’t have a hard time moving around it. As it also comes with casters, you can move it around as well. If you’re worried about the crank becoming a hazard, fret not. It’s actually hidden on the side so it won’t hurt anyone. You can even decide which side to put it on for your convenience. It also works very smoothly, so you shouldn’t have a hard time turning it. In terms of sturdiness, this desk is heavy and can promise years of use. Even the crank feels very substantial, so you don’t have to worry about it conking out after a few months. It’s definitely a great piece for its price and will already let you save as compared to other standing desks in the market today. The LUXOR Standup-CF48-DW Stand Up Desk is another top standing desk pick by lots of folks because of its fuss-free design. It’s functional and professional-looking, so you won’t have a hard time blending into your office space. Its medium size can also be a great guarantee that it will fit in most work areas, so it can really be the best standing desk for you. Equipped with a hand crank for easier height adjustment, you only need some upper body strength to tweak this table’s measurements to suit your needs. It can be adjusted from 29" to 42.75" so it will suit different heights. It can also easily work as a sit-stand desk, especially if you don’t mind working on the hand crank a few times daily. This desk is also portable, thanks to its removable casters. However, if you don’t think you need to move it around, you can opt out of installing the wheels. Keep in mind that it will affect the height, so if you’re seriously tall, this can be an issue. What really makes it a great choice is its sturdiness. It can handle up to 154 lbs, which can already hold a lot of equipment. This helps guarantee its quality and durability, so you can count on it to last for years. If you want the sleekest-looking sit-stand table there is, you should definitely check out the DEVAISE Adjustable Height Standing Desk 55 Inches with Crank Handle / White. This product will easily match any contemporary office interiors with its monochromatic, minimalist styling. You can choose from the black or white options so you can find the best match for your space. Aside from its appearance, this desk also offers a large work space. It’s a bit bigger than most of the medium sized options in the list, but it’s not too big that it will take up every inch of your office space. It will also offer extra counter space for your equipment, which is what lots of folks look for in the best stand up desks. Its adjustable size is also a good reason to opt for this product. You can easily change its height between 29" to 45" depending on your height and whether you want to work standing or sitting. As the hand crank is also very easy to work with, you don’t have to worry about frequently adjusting your desk’s height. As for sturdiness, some say that it has a slight wobble, but others don’t really have any complaints. It would be best to make sure that it’s assembled correctly to avoid such problems. One struggle with even the best adjustable height desks is that you’ll sometimes need to separately get a monitor mount if you don’t want to look down on your screen while working. This is why two-panel desks like the Soges Adjustable Stand Up Desk Standing Desk tend to catch a lot of people’s attention. It’s designed to provide two adjustable surfaces so you can easily configure the desk to however you see fit for your needs. With two independently adjustable panels, it can work as a tiered standing desk. The back panel can be easily adjusted to a higher height to hold your monitor to your eye level, while the front panel can be adjusted at a lower level so you don’t have to lift your arms just to work on your keyboard. This table’s height can be adjusted from 27.6" to 45.3" making it suitable for use while sitting or standing. It can also comfortably fit folks of varying heights. Another great thing about this desk is it’s extremely affordable. If you’re on a tight budget but you want to give standing desks a shot, this product will do the trick. However, it can be a bit small. It’s only 23.6” wide, so it won’t fit dual monitor set ups or a lot of other stuff while you work. It’s perfect for home use, though. It can even be a good option if your teenager wants to try out sit-stand desks.